Inside the compact AT&T branded retail box of the LG Nitro HD, you will find the phone, a charger, a USB cable, and a 16GB microSD card. The usual booklets are also present. While the 16GB card is a welcome sight in the box, we do believe that a pair of headphones would have been great as well. After all, the Nitro HD is a seriously capable multimedia device. The LG Nitro HD is one good-looking handset. Its design is clean and clutter free, while the all black color scheme adds a touch of understatement. The textured plastic on the back looks and feels great. The camera unit has been finished with a touch of brushed metal, which looks nice. So does the LG logo right under it. With measures of 133.9 x 67.8 x 10.4mm the phone is not the smallest you can find out there. Its 127 grams of weight however, make it feel light and easy to handle. There is nothing to fret about regarding the build quality of the LG Nitro HD. The device is very well put together and makes use of high quality materials. And now to the screen: the 4.5” AH-IPS screen of the LG Nitro HD lives completely up to the hype, which surrounds it. Its HD (720 x 1280 pixels) resolution gives it a pixel density, which is up there with the iPhone 4S’s. The viewing angles are superb and so is its sunlight legibility. When it comes to contrast however, it is still not better than the Super AMOLED Plus units which Samsung makes. Below the screen you will find three touch sensitive buttons. The home button is logically in the middle. On its right side is the back key. The options and search buttons are cleverly combined into one. Long pressing it will get you into Google search, while a short press gives you the options. Above the screen is the earpiece, the ambient light and proximity sensors, as well as the front-facing camera of the device. The left side of the Nitro HD is home of the volume rocker. On the right side, you will find absolutely nothing. A camera button would have been nice, we think. The top of the LG Nitro HD is its busiest part. There, you will find the 3.5mm audio jack, a secondary microphone for active noise cancellation, the microUSB port, as well as the power/lock button. On the bottom of the device, you will encounter the battery cover latch, with the mouthpiece tucked into it. The back of the Nitro HD is home of the 8MP camera and its LED flash, as well as the loudspeaker. There are no surprises under the battery cover. The microSD card of the LG Nitro HD is hot-swappable. The SIM card is not. The 1830mAh battery is probably the weakest link of the otherwise powerful package. Its quoted standby time is 252 hours, which is quite ambitious and far from what we have encountered so far even with LTE connectivity turned off. 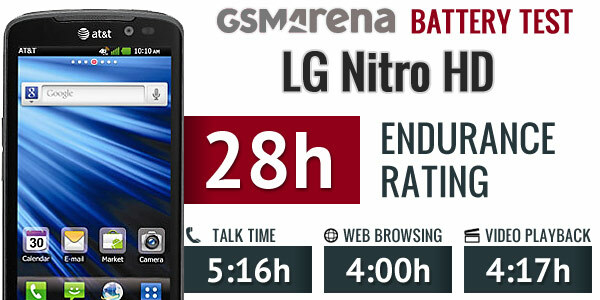 The LG Nitro HD achieved the lowest result we’ve encountered in our battery test do so far. Its score of 28 means that you will have to recharge your device every 28 hours if you use it for an hour each of phone calls, web browsing and video playback per day. You can get the full scoop on our battery test of the LG Nitro HD here. The LG Nitro HD is surprisingly nice to handle for its size. Even one-handed operation is possible. The textured plastic on the back is great in preventing accidental drops. 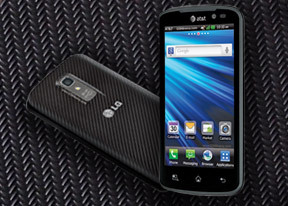 The LG Nitro HD delivered well in the design and build quality section. Now, it is time for the most important part of the device – its software. The experience in this section is usually a deal breaker for most consumers.